Rum and raisin cupcakes are a simple cupcake recipe enlivened by cinnamon and rum-soaked raisins. You can easily make a gluten-free version by using commercial gluten-free flour and baking powder rather than self-raising flour. For a different flavour, try using dried blueberries and replacing dark rum with white rum, or try mixed peel and Cointreau, replacing the cinnamon with vanilla essence. Coarsely chop raisins and soak overnight in rum in a ceramic bowl. Next day, place the butter in a small saucepan and melt over low heat then let cool slightly. In a large bowl, mix together flour, sugar and cinnamon. Beat eggs and add to dry ingredients along with milk and butter. Mix to form a smooth batter and stir in the rum-soaked raisins, including any rum that has not been soaked up by the fruit. Fill batter into greased, paper-lined cupcake pans. To allow room to rise, each tin should only be two-thirds full before baking. Bake cupcakes for 12-15 min at 180 °C (fan-forced) or until a skewer inserted in the centre comes out clean. Let cool slightly before removing from tins. Makes 18 full-sized cupcakes. 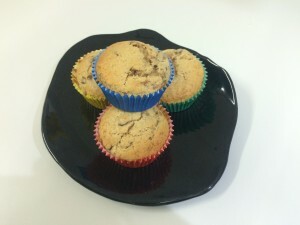 Alternately, you can bake the mixture as mini-cupcakes. Use the same baking temperature, but shorten the baking time to 8-10 min. If you want to make a gluten-free version of this recipe, you can use a commercial gluten-free flour mix available in most supermarkets. You can also make up a mixture of rice and tapioca flours with potato starch as described here. To convert the flour mixture to a self-raising version, add 1 ½ tsp baking powder to 180 g flour.